1. 2. 3. 4. 5. 6. 7. 1. 2. 3. 4. 5. 6. 7. 8. 9. 10. 11. 12. 13. 14. As a part of the first Design Studio in the University, the task was to simply design a single-story house with no constraints whatsoever. The site was virtual, the requirements were virtual and the client was the preference of your choice. As I was deeply rooted into photography, my client was the mere reflection of myself. The house needed to accommodate a private studio,a bedroom with a small living room and an inner courtyard where my dogs could play as around and I could contemplate about things and do my gardening. At the time, the only architectural object that I knew was the Glass House by Philip Johnson which was the icon of modern architecture. “..The Unfinished Struggle Of My Rubik’s Cube Was The Finished product for my struggle..” The only outline of this design task was to design a three story building. As I was struggling to find the design approach for this project l, I saw my brother’s Rubik’s Cube on the table next to me, which I could not solve for ages. The unfinished three layers of the Rubik’s Cube somehow became a source of fascination for me. So the process of form finding began with this Rubik’s Cube. And at the end, the unfinished struggle of my Rubik’s Cube was the finished product for my struggle for the project. â&#x20AC;&#x153;..Achieving a goal to develop a unique culture context and the public spaces in a location which was well known for its communal characteristics. â&#x20AC;? DWELL: The Sustainable Environment Retreat is a learning and research center. It is a sustainable designbuilding project that has two components. It offers practical experience for people to actually live in residential green space. And, the retreat compound a research facility focused on energy efficient design and techniques. While, The Green Retreat Experience is about living in a space that is Eco-friendly, the Energy Research Centre will contribute to develop new forms of sustainable energy. The Dwell project intends to establish this building as a learning and research center. It is a multidimensional public facility where anyone from the community can get first hand experience on sustainability. Itâ&#x20AC;&#x2122;s a gallery for artists to express their creativity through recycled material and itâ&#x20AC;&#x2122;s a practical model for energy efficient buildings. This project proposes a center that will make the community realize that being environmentally friendly is not just behavior but also a lifestyle. Indoor Greenery OBJECTIVES A. Eco-literature and communication initiative: The center will focus on imparting knowledge about the natural and manmade environment. It will provide a scope for the students, teachers and consumers, about the importance of energy and the fundamental issues and problems surrounding its production and use. It will focus on the need of sustainable design standards for the future. â&#x20AC;&#x153;..Project intends to establish this building as a learning and research center. . â&#x20AC;? â&#x20AC;&#x153; ..Adopting sustainability as its core theme â&#x20AC;? Hariyo Chowk is a collaborative educational space for sustainable design and urban farming in Kathmandu. As Kathmandu is rapidly in the process of urbanization, there are fewer green spaces left in the city once known for its strong tradition of urban farming. In spring of 2012 Sattya Media Arts Collective planted an initiative to transform a courtyard into a modern adaptation of the traditional chowk. The project was financially supported through crowd funding by raising 15000 USD In the process, we built relationships with students, community and local organizations and working together we build a rainwater collection system to reduce reliance on city water, a bamboo structure for vertical gardening for native, edible, and medicinal plants, a workshop area for arts and education alongside an earthen oven made out of mud bricks. After more than a year, the entire site was completely disassembled in a day and the materials were reused and reallocated in a smaller scale. 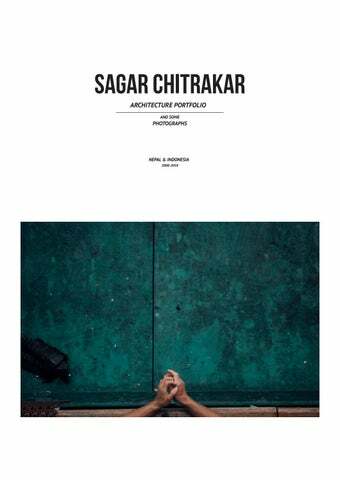 â&#x20AC;&#x153; ..Transform a courtyard into a modern adaptation of the traditional chowk.â&#x20AC;? The task of the project was to design a facade for a commercial building in Birtamod, a commercial, educational and transport hub with rich traditions of art and culture. The pattern for the facade was inspired by the traditional fabric pattern of the local community. By drawing inspiration from this intricate fabric and it’s patterns, the facade was designed which had a potential to stand out amongst the ugly neighboring street scape. “ .. Facade’s aesthetic was also a reflection of it’s local craftsmanship and heritage. ” The facade’s aesthetic was also a reflection of it’s local craftsmanship and heritage. Besides this added value, the modular facade was designed to provide the much-needed shading for the hot climate. Later, the client decided to go for the same sterile facade as its neighboring buildings. The Brace is a self-made conceptual project for row-housing apartment, setup in a dense urban environment. The concept of the project was to have minimal footprint on the ground which would act as a communal space for its inhabitants and at the same time maximize the density of the site without compromising each other. Based on a modular, flexible and adaptable design, the construction was envisioned to be a modular design which could adapt as per the need of one’s community. â&#x20AC;&#x153; .. Based on exploring the simplicity of the basic shape - square. .â&#x20AC;? This project is my interpretation of the house in the woods inspired by other designers who were exploring under the same title. The house is based on exploring the simplicity of the basic shape-square. With two extended viewing decks on top of the floor, one would get safe panoramic view the site had to offer. The house was envisioned as an off grid building unit and through the position and orientation, consider lighting and heating aspects. â&#x20AC;&#x153; .. With an intention on exploring a space that reflects plainness, tranquility and closeness to nature.â&#x20AC;? The Spirit of Places is a conceptual series, with an intention on exploring a space that reflects plainness, tranquility and closeness to nature. The open space is filled with reflection of the light that changes with sunset and sunrise. The smell of the nature welcomes you pleasantly and one can be truly immersed with nature and be the part of the play of the light The space is envisioned as a space one can find a peace within and just contemplate. Building Trust International and the Government of Mongolia announced an International Design Competition for a school design proposal that could withstand the extreme Mongolian Climate. The team proposed a design which would act as a safe, comfortable, learning environment withstanding the extreme temperature in Mongolia. The design aimed to harbor a feeling of belongingness with the use of motifs of the traditional Mongolian building; the yurt. With empty white walls, it encourages te children’s creativity and create their own pleasant playful environment. The building assimilates nature in the design by implementing berm housing with passive heating system, also the use of compressed earth blocks manufactured with the soil that is obtained from the site itself helps suffice the sustainable approach. The roof of the building delivers an open space in the ground level that provides the children with enough outdoor play space and in a way yields the portion of land in which the building was initially constructed. The project was to renovate a small derelict house located in Lele, a small valley 14 KM from Kathmandu. The earthquake had caused major damage in the infrastructures of the entire village. And there was a major change in social and economic pattern of the entire village. Most of the houses were abandoned, and the small village was almost empty. With common goal in mind, I worked alongside a group of local builders and potential investors. For the first phase, the plan was to make it structurally sound and convert into a Bed and Breakfast unit. During the process, it will retain the existing viable structures, and empower locals to take part in the construction process. â&#x20AC;&#x153; ..Purpose of the project was to revive the social and cultural activities and most importantly regain the long lost trust on natural materials that they had been using for ages. â&#x20AC;? For extra strengthening of the masonry walls, it will be braced from both sides with cross wooden joists. The whole purpose of the project was to revive the social and cultural activities and most importantly regain the long lost trust on natural materials that they had been using for ages. The process included a lot of iterations, experimentation, and refinements, and ultimately it was a process of discovery of the right solution in the process, which was to keep intact the existing elements in a safer way as much as it was possible, and the remaining cracks would be left as a reminder of the earthquake. On April 25 2015, an earthquake of magnitude 7.8 Richter scale earthquake devastated the lives and physical infrastructure of Nepal. Over 10,000 people lost their lives and over 500,000 homes, 40,000 schools were destroyed. â&#x20AC;&#x153;I quit my job the same day and joined ABARI,â&#x20AC;? I quit my job the same day and joined ABARI, who initiated a very small campaign to provide cotton tents and tarps to a community affected in Gorkha. The campaign snowballed and hundreds of people joined hands from all around the world to join this effort. Looking at the context, we created a do-it- yourself manual for transitional shelters with flexible and diverse designs that encouraged homeowners to build transitional homes using salvaged material. It is estimated to have directly reached of more than 30,000 families in ground. I was part of the barefoot architects and builders who went to over 20 villages in Sindhupalchok and Kavre to teach local communities ways to make transitional shelters. Besides this, I also spearheaded several teams to build transitional schools around Kathmandu during this time. ABARI with collaboration with The Karmi Initiatives, designed a house for Sanu Maya Tamang considering her situation as a single mother whose house was completely damaged by the earthquake. With a daily wage of USD 2.5, and having lost her husband a few years ago, she was not in a position to rebuild her house. Moreover, having differently-abled daughter, Muna (aged 13) and young son, Bijay (aged 11), had exacerbated her situation. “The house also acted as a demonstration ... not just for the community but for the whole country. ” The house is strategically designed with respect to the topography of the site and acted as a demonstration for postearthquake permanent reconstruction, not just for the community but for the whole country. Built using locally available materials - bamboo and earth, the house is one of the best examples of sustainable reconstruction in post-earthquake Nepal. It is a solar passive house with rain water harvesting, selfsufficient power supply through PV cells, biogas, improved cooking stove and an organic kitchen garden which follows principles of permaculture. The construction of a house is the synergy of varying elements— raw materials, financial and human resources, skill and time. The school design can transform and expand according to individual village needs and site conditions. Built with local, and natural materials, it is climate responsive and has universal access in all of itâ&#x20AC;&#x2122;s units. With a belief that through the hands on construction process with locals, not only is a building created, but a whole community can be empowered. The design is flexible and encourages involvement from the local community in both the building and planning phase in order to reinforce a sense of ownership and pride. One of the objectives for this type of ecological building construction is to inspire others to imitate the new style of construction and foster a new trust in the local and vernacular materials. I was the lead designer for this project and had to defend with the Government of Nepal through the rigorous process in which the officials had to be convinced that local and vernacular materials were strong and viable option than opting for easier concrete construction which had no place in the rural settlements of Nepal. At the end, the design was unanimously approved and was distributed as an open source design. Community Forest In partnership with Gyetrul Jigme Rinpoche, Mero Gaun is a model village that sets an example for post-earthquake reconstruction and sustainable development in Kulay in Okharpauwa VDC in Nuwakot district. Nested in a beautiful location overlooking the mountains, Kulay lies about 12 km North-West of Kathmandu. The village was uninhabitable after the earthquake, and all of its 55 homes collapsed. ABARI assisted and trained 55 households to build Compressed Earth Block and Improved Stone Masonry houses using locally available resources. â&#x20AC;&#x153; The objective of the project was to design a model village that integrates sustainable design practices in relation to energy, agriculture and livelihood. â&#x20AC;? “ To combine traditional Balinese technology, material and it’s craftsmanship with a contemporary approach through a process of form finding in architecture. ” The structure for the design is planned in a circular base that holds a tea room and other supportive program around the philosophy of ` Gong. The roof canopy is based in a grid shell structure which seeks to combine traditional Balinese technology, material and it’s craftsmanship with a contemporary approach through a process of form finding in architecture. The building stands out and harmonizes at the same time with its surrounding traditional buildings. â&#x20AC;&#x153;..Gives the podium for the user to be in the momentary pause and appreciate the surrounding..â&#x20AC;? With an introduction of a courtyard in the middle of the site, it created a much needed buffer between activities from the living room, kitchen and the pool on the upper level towards two bedrooms on the lower level. The house blends in as just as a part of the landscape and gives the podium for the user to be in the momentary pause and appreciate the surrounding from all of itâ&#x20AC;&#x2122;s rooms and terraces. With regards to the sun paths, prevailing winds and uncertainty about the neighboring buildings, the single storied the family house on one floor has been designed with guaranteed views the site has to offer, with orchestrated view corridors. The distinct feature of the design is the courtyard which is the reinvention of the courtyard house by introducing views and also a space for vegetation, sunlight and airflow. This feature brings the community within the house together while maintaining privacy for every room. It also provides uninterrupted viewing corridor even for the rear programs of the houses, which overlooks the front ones. It’s a simple architecture with use of borders as structural means, giving optimal use of the space. The boundaries are installed with adjustable louvers, which not only give the natural circulation of the air flow, but at the same time provides the much needed privacy from the surrounding, whilst providing views of the beautiful surroundings. â&#x20AC;&#x153;..Based on a folded slab construction.â&#x20AC;? Co-Tel is a proposal for a mixed-use development dedicated to the new typology of the hostel, which incorporates co-working with a hotel. The overlaying shared spaces led to a series of interesting floor plans where high density lead to both formal and informal places of gathering. The recreational areas between ‘loud’ and ‘silent’ programs were designed as a blend of different levels, nooks, corners - little plazas and meeting spots to encourage meeting like minded people. Efficiency as sustainability was one of the major credos for the architectural decisions. The energy consumption of the structure was planned to be drastically reduced through the use of passive cooling via voids which also acted as a place of meeting and collaboration for its inhabitants. The liberation of the volume from the ground plane provided protected outdoor areas. And, the stack of program at the upper floor opened up towards the sea view. Further, the program within the building was arranged to take provide much needed shading and at the same time catch the breeze from the sea. The intersection of the two volume creates interesting nooks and corners for the space to keep on exploring. The design is also an ideal example how the tectonics of the design co related to the topography of the site. The intersecting volume doesnâ&#x20AC;&#x2122;t only provide the grandeur entrance, but also progressively extends the indoor space towards outdoor though an infinite pool. With the concept of transparency and opaqueness, the house has been planned accordingly. The bedrooms are tucked away in a solid framework providing them much needed privacy and the living space has been designed in an open plan in the upper level. Thus level was possible to remain entirely open when needed through the design of the truss work embedded in the minimally designed roof. Thus this living space creates a feeling of being completely outside, and at the same time provides the much-needed protections through intricate window sections and nooks that holds a series of retractable sun blinds. While the formal essence of the design is modern, the use of local and traditional materials through the craftsmanship of local artisans, it evokes a traditional resonance to the island of the Bali. The concept for House R was designed for an American entrepreneur, record producer, and author, who just moved to Bali. He has been always attracted by the rich spiritual culture and tradition that Bali has to offer. He was seeking for a house which encouraged him to tune in with himself with space for meditation and yoga practices. The concept for the house was a translation of fusing formal citation of vernacular Indonesian Architecture -Minang into contemporary, which was inspired by the geometries of FĂŠlix Candela. The house is designed for a Icelandic multiinstrumentalist and producer. The artist wanted to experience a space as being inside of an instrument itself where sounds would harmonize. The 5 bedroom house holds a 150m2 loft spaces overlooking the lush surrounding green paddies with itâ&#x20AC;&#x2122;s amphitheater gently dipping. This transitional space from the living room to the exterior is facilitated by a dent in the floor slab with a curved staircase flowing into the garden. This creates a feeling of openness and a subtle sense of natural vibves flowing in by sounds and smells, to become one to its surrounding. The ceiling drops down in equal manner to improve acoustics and to indicate the entrance as a gesture. This element adds to the essence of the sculpted interior experience of the space and is free of structural necessity. Project Architect, Permanent Shelter, May 2015 to January 2016	• Designed first post earthquake prototype house for a single women • Supervised built sites with close linkage with family, community and volunteers from all over the world. Project Architect, Permanent School, June 2015 to January 2016	• Designed Open Source School Design • Rethinking existing paradigm of educational spaces for children in Nepal post earthquake. Architect, Model Village, August 2015 to January 2016	• Design a prototype house of locally source natural material. • A model village where sustainability and creating of a value chain will be fostered Project Architect, Bodhi Hill, July 2015 to January 2016	• Conceptual detail design of a sustainable school built of rammed earth and bamboo in the foothills of the forest.